Vaccines for Travelers | The Medical Letter, Inc.
CHOLERA — Cholera is endemic in many countries in Africa and South and Southeast Asia. In recent years, most outbreaks have been caused by toxigenic strains of Vibrio cholerae serogroup O1. Cases caused by serogroup O139 have occurred in a few areas in Asia. For most tourists, the risk of cholera is very low. Travelers who might have a higher risk of exposure include those who plan to work in refugee camps, in outbreak settings, or as healthcare providers, and those visiting friends and relatives or staying for extended periods in affected areas. HEPATITIS A — Hepatitis A virus (HAV) is common in countries where sanitation is poor and access to clean water is limited, including many parts of Africa, Asia, Central and South America, and Eastern Europe. Areas with low levels of endemic HAV transmission include Western Europe, Japan, New Zealand, and Australia. HAV vaccination has been part of routine childhood immunization in the US since 2006. Recommendations – HAV vaccine is recommended by the ACIP for all unvaccinated travelers going to countries with intermediate or high HAV endemicity.7 However, there is a potential risk of foodborne HAV infection even in countries with low endemicity; some experts advise all persons traveling outside the US to consider hepatitis A vaccination regardless of their destination. To view a more detailed table, click here. HEPATITIS B — Hepatitis B surface antigen (HbsAg) prevalence is generally high in sub-Saharan Africa and the Western Pacific region and low in most countries in the Americas, Western Europe, Japan, and Australia.12 Hepatitis B virus (HBV) vaccine is part of routine childhood immunization in the US. The Vaccines – Northern Hemisphere influenza vaccine is usually available in the US from August until the end of June. The vaccine formulations may be the same in the Northern and Southern Hemispheres. If they are different, high-risk patients from the Northern Hemisphere who travel to the Southern Hemisphere during that region's influenza season could consider vaccination prior to departure with a US-licensed Southern Hemisphere formulation (Fluzone Quadrivalent Southern Hemisphere), if available, or vaccination upon arrival in the Southern Hemisphere. Serum antibody levels peak about 2 weeks after vaccination in most adults. A single dose of Ixiaro has been shown to effectively boost antibody levels in persons vaccinated with a previously available vaccine (JE-Vax), but the duration of protection is unknown; the ACIP recommends that persons previously vaccinated with JE-Vax who require continued protection receive a 2-dose primary series of Ixiaro. The Vaccine – The measles vaccine is available as a live-attenuated vaccine in combination with mumps and rubella (MMR; M-M-R-II) or with mumps, rubella, and varicella (MMRV; ProQuad; approved only for children 12 months-12 years old). MENINGOCOCCAL — Outbreaks of meningococcal disease can occur anywhere in the world, but they are most common in the African "meningitis belt" (semi-arid areas of sub-Saharan Africa extending from Senegal and Guinea eastward to Ethiopia). Recent outbreaks have primarily been due to Neisseria meningitidis serogroups C and W.
The Vaccines – Two quadrivalent inactivated vaccines against N. meningitidis serogroups A, C, W, and Y (MenACWY; Menactra; Menveo) are available in the US.29,30 Both contain meningococcal capsular polysaccharides conjugated to a protein carrier. A third unconjugated quadrivalent polysaccharide vaccine (Menomune) is no longer available in the US. Two vaccines against N. meningitidis serogroup B (MenB; Trumenba; Bexsero) are available for use in persons 10-25 years old. MenB vaccine is not routinely recommended for travel unless an outbreak has been reported. PNEUMOCOCCAL — The incidence of pneumococcal disease is higher in some developing countries than in the US. Pneumococcal vaccination has been part of routine childhood immunization in the US since 2010. The Vaccines – Two pneumococcal vaccines are available in the US: PCV13 (Prevnar 13), a conjugate vaccine that contains 13 serotypes of pneumococcus, and PPSV23 (Pneumovax 23), a 23-valent pneumococcal polysaccharide vaccine. POLIO — In 2018, the only countries with wild poliovirus circulation during the last 12 months were Pakistan and Afghanistan. Outbreaks of vaccine-derived poliovirus have occurred in some other countries, mainly in Africa. Recommendations – All persons traveling to countries with wild or vaccine-derived poliovirus circulation should complete a primary series of inactivated polio vaccine (IPV; Ipol) before leaving the US. Adults who have not previously been immunized against polio should receive a 3-dose primary series of IPV (2 doses 4-8 weeks apart; third dose 6-12 months after the second). If protection is needed sooner, 2 or 3 doses can be given ≥4 weeks apart; if <4 weeks are available before protection is needed, a single dose is recommended. Adults who previously completed a primary series and have never had a booster should receive a single booster dose of IPV. 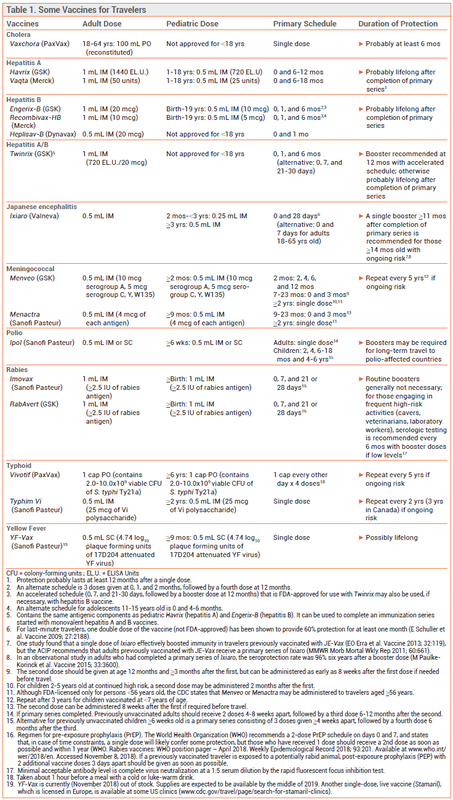 Previously unimmunized children should receive a 4-dose primary series of IPV beginning at age ≥6 weeks; the first 3 doses should be given ≥4 weeks apart, followed by a fourth dose ≥6 months after the third. A child who received 4 doses before age 4 should be given a fifth dose at age 4-6 years. The Vaccines – Two rabies antigen vaccines are available in the US (Imovax; RabAvert). According to the CDC, cell culture rabies vaccines available outside the US are acceptable alternatives to FDA-approved vaccines, but neural tissue vaccines, which have high rates of serious adverse effects, are not. RIG is not readily available in developing countries, and even when it is, its purity and potency may be less reliable. Purified equine-derived RIG is available in some developing countries and has been used effectively, with a low incidence of adverse effects. TETANUS, DIPHTHERIA, AND PERTUSSIS — Vaccination against tetanus diphtheria, and pertussis, which is part of routine childhood immunization in the US, is recommended for all travelers. Recommendations – Previously unimmunized children should receive 3 or (preferably) 4 doses of pediatric diphtheria, tetanus, and acellular pertussis vaccine (DTaP) before travel. An accelerated schedule can be used beginning at age ≥6 weeks: the first 3 doses are given 4 weeks apart and the fourth dose is given at age ≥12 months and ≥6 months after the third. A booster dose of inactivated Td vaccine is recommended every 10 years for adults. All persons ≥11 years old who have completed a primary childhood series and have not yet received Tdap vaccine should receive a single dose, which can be given regardless of the interval since the last Td dose to provide pertussis protection before travel. Pregnant women should receive Tdap during each pregnancy. TYPHOID — Typhoid fever is usually acquired through consumption of food or water contaminated with Salmonella typhi. The risk is highest in South Asia. Other risk areas are East and Southeast Asia, Central and South America, the Caribbean, and Africa. The Vaccines – A live-attenuated oral typhoid vaccine (Vivotif) is available for adults and children ≥6 years old. It is taken every other day as a single capsule (at least 1 hour before eating) for a total of 4 doses, beginning at least 2 weeks before departure. The capsules must be refrigerated. Antibiotics should be avoided for at least 24 hours before administration of the first dose and for 1 week after administration of the last dose. The vaccine provides protection for about 5 years. A purified capsular polysaccharide parenteral vaccine (Typhim Vi) is FDA-licensed for use in adults and children ≥2 years old. It is given at least 2 weeks before departure and provides protection for about 2 years. A combined hepatitis A/typhoid vaccine (Vivaxim) is available in Canada. VARICELLA — Varicella is endemic worldwide. Vaccination against varicella has been part of routine childhood immunization in the US since 1996. The Vaccines – Two varicella-containing vaccines are available in the US: single-antigen varicella vaccine (Varivax), which is licensed for use in persons ≥12 months old, and combination measles-mumps-rubella-varicella vaccine (MMRV; ProQuad), which is only licensed for use in children 12 months-12 years old. YELLOW FEVER — Yellow fever virus is transmitted by the bite of an infected mosquito. It is endemic in tropical South America and sub-Saharan Africa. Some countries require an International Certificate of Vaccination or Prophylaxis (ICVP, "yellow card") as proof of vaccination against yellow fever, or a physician's waiver letter, from all entering travelers; other countries require evidence of vaccination from travelers coming from or traveling through endemic or infected areas, including brief airport transits. An updated list of countries requiring proof of yellow fever vaccination is available at www.cdc.gov/travel. The Vaccine – US-licensed yellow fever vaccine (YF-Vax) is a live-attenuated vaccine prepared in eggs. It is usually available from providers certified by state health departments, but at press time it is temporarily out of stock; supplies are expected to be available by the middle of 2019. Some clinics are offering an alternative single-dose live vaccine (Stamaril – Sanofi Pasteur). A list of these clinics is available at wwwnc.cdc.gov/travel/page/search-for-stamaril-clinics. Stamaril, which has been used for decades in Europe, is available in the US under an investigational new drug program. It is comparable in efficacy and safety to YF-Vax.